Gov. Jerry Bown and other elected officials gathered at Union Station on Wednesday morning to sign a bill authorizing the state to sell $4.7 billion in bonds to build 130 miles of high-speed rail track between Bakersfield and Madera in the San Joaquin Valley and fund local transit improvements in both the Los Angeles and Bay Area regions. The Governor is scheduled to hold a similar ceremony in San Francisco this afternoon. The $4.7 billion in bonds is supposed to be matched by $7.9 billion in federal funds and local monies. Here’s the news release from the Governor’s office. 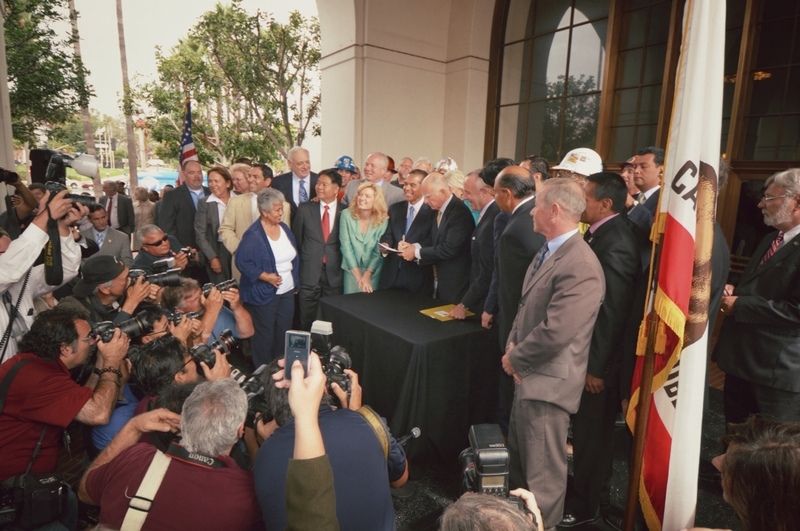 In our area, the bill signing means there will be $350 million availabe for fly-through tracks at Union Station, which should help improve Metrolink and Amtrak service. In addition, $115 million will go to the Regional Connector project and $88.7 million to Metrolink to likely be used for grade separations and new locomotives. High-speed rail officials said construction on the first segment of the line should begin in 2013 and that there will be high-speed rail service between the San Joaquin Valley and the L.A. area in 10 years. At present, Amtrak runs a bus between Los Angeles and Bakersfield. Also, any thoughts on whether this will encourage Metrolink to move to electrification of its locomotives? Let’s get this thing up and running already. Imagine if we had already started construction in 2008?